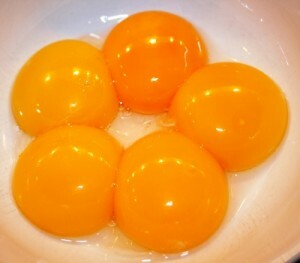 Concerned about the cholesterol in egg yolks? Worried about protecting your heart health? Egg yolks have long been maligned because of their cholesterol content, but cholesterol itself does not cause heart disease. In fact, while LDL, a major carrier of cholesterol in the blood, does have a role in heart disease, it is when poor metablism, deficient diets, and toxins destroy the LDL particle that heart disease develops. There is also little evidence to support the common belief that consuming raw egg yolks is dangerous.